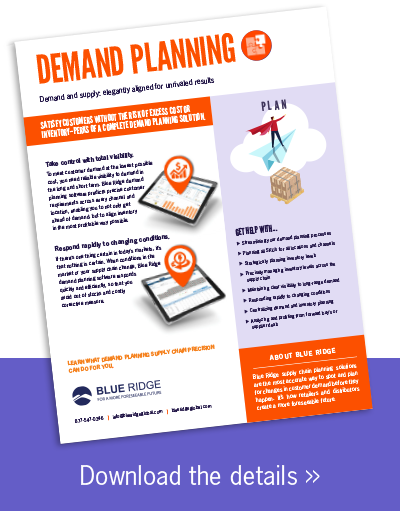 Blue Ridge Cloud-Native Supply Planning creates fully configured orders, economically optimized to your company’s goals for up to 24 months in advance. These precise order projections are completely automated without user intervention and adhere to order schedules, SKU level rounding requirements and order level constraints. Our unified demand and supply plan predicts daily store demand, distribution center demand, receipts and on-hand inventory to create the optimal plan considering the unique dynamics of every item, location, channel and supplier. To meet customer demand at the lowest possible cost, you need reliable visibility to demand in the long and short term. Blue Ridge Cloud-Native Demand Planning predicts precise customer requirements across every channel and location, enabling you to not only get ahead of demand, but to align inventory in the most profitable way possible. If there’s one thing certain in today’s markets, it’s that nothing is certain. 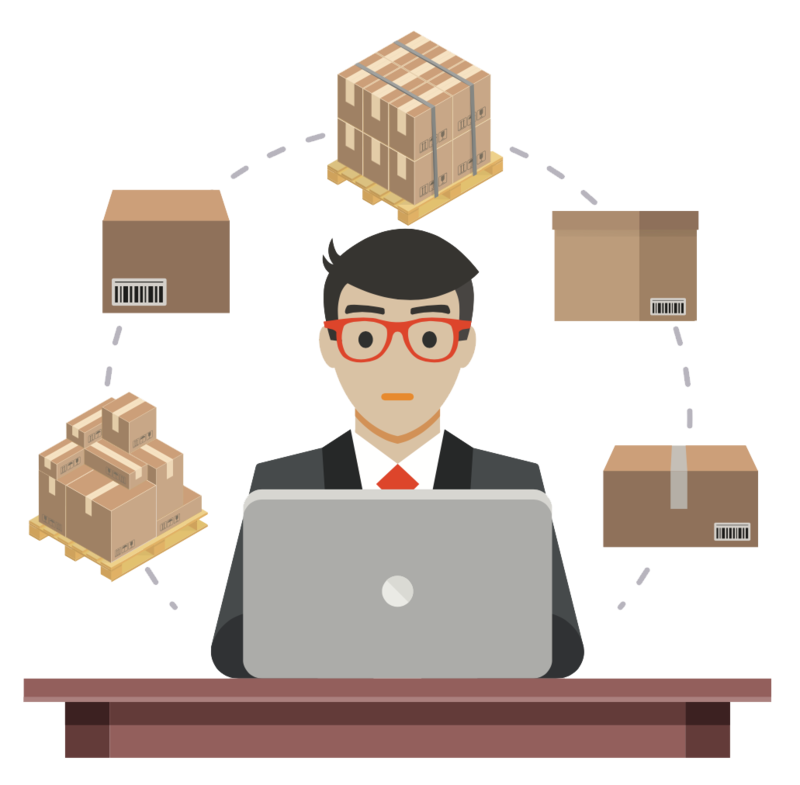 When conditions in the market or your supply chain change, Blue Ridge demand planning software responds quickly and efficiently, so that you avoid out of stocks and costly corrective measure. 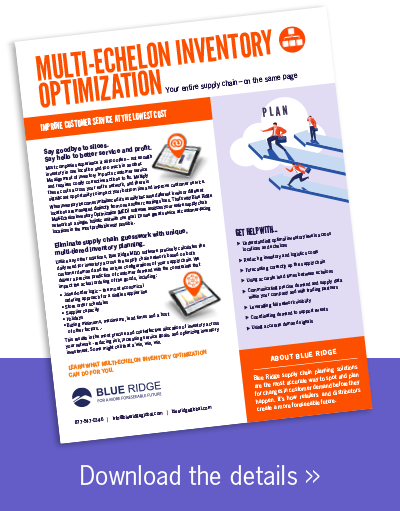 Blue Ridge Cloud-Native Multi-Echelon Inventory Optimization (MEIO) precisely calculates the daily need for inventory across the supply chain network based on both customer demand and the unique configurations of your supply chain. We deliver a precise prediction of customer demand with the constraints that impact the actual ordering of goods, including: joined-order logic, store order schedules, supplier capacity, holidays, buying minimums, maximums, lead times and a host of other factors. Blue Ridge MEIO analyzes your entire supply chain network as a single, holistic unit with one goal: Ensure great service at customer-facing locations in the most profitable way possible. This results in the most precise and cost-effective allocation of inventory across your network - reducing risk, increasing service goals, and optimizing inventory investment. Blue Ridge provides supply chain visibility through constant analysis of real-time data. Blue Ridge Cloud-Native Supply Chain Analytics is laser-focused on planning, forecasting and replenishment, empowering you to assess the proper course of action, instill accountability and achieve consistent improvement. 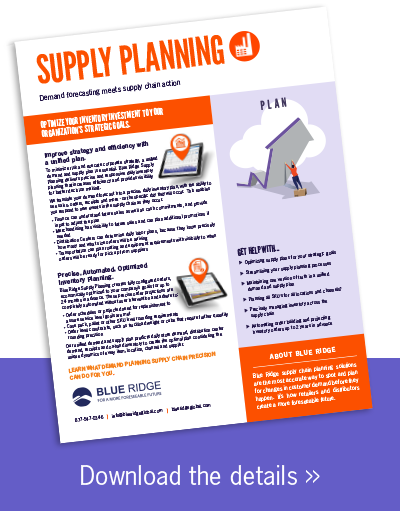 Blue Ridge Supply Planning Cloud-Native creates fully configured orders, economically optimized to your company’s goals for up to 24 months in advance. These precise order projections are completely automated without user intervention and adhere to order schedules, SKU level rounding requirements and order level constraints. To meet customer demand at the lowest possible cost, you need reliable visibility to demand in the long and short term. Blue Ridge Cloud-Native demand planning software predicts precise customer requirements across every channel and location, enabling you to not only get ahead of demand, but to align inventory in the most profitable way possible. Blue Ridge provides supply chain visibility through constant analysis of real-time data. 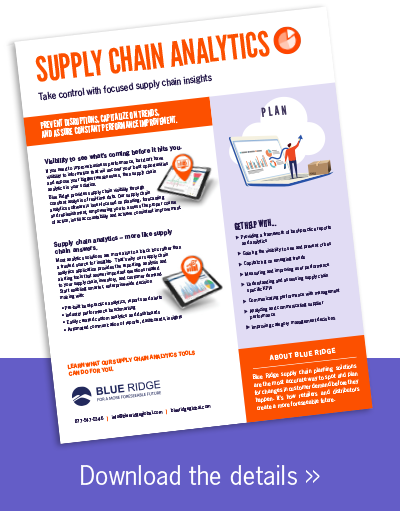 Blue Ridge Supply Chain Analytics is laser-focused on planning, forecasting and replenishment, empowering you to assess the proper course of action, instill accountability and achieve consistent improvement. Learn the supply chain strategies that your peers are implementing in 2019. See how our Supply Chain Planning Cloud's strategic offering stacks up strategically, architecturally, operationally and functionally. Ready to Transform Your Business with our Cloud-Native Supply Chain Solutions?